In what scenario does an F-15C face an Su-35S without support from allied and stealth assets? Seems silly to play yesterdays game in tomorrow's reality. madrat wrote: In what scenario does an F-15C face an Su-35S without support from allied and stealth assets? thats difficult to imagine but I wouldn't say impossible. I mean, do ground troops always get all the air support they requested for? Theres a massive number of CAS and CAS capable platforms available. If ground troops can't get all the CAS they want in relatively small conflicts like the ones in the middle east. What more in a non-nuclear conflict with a Peer adversary like China. Anyway, heres my point. Do you agree that the F-15C still has a niche to fill post 2040. However the F-15Cs, built in the 80s will be way past their service lives post 2040. So the USAF simply wants to keep a small fleet of F-15s for post 2040 ANG squadrons, but they can't buy brand new F-15Cs with 80 tech, so why not buy upgraded F-15QAs and F-15SAs that are currently being produced and call it F-15X. Thats what this is. zero-one wrote: thats difficult to imagine but I wouldn't say impossible. It's silly to train for that once in a lifetime situation while you can put that same training-time into preparing for actual real life combat. SpudmanWP wrote: On the bean-counting side, that argument failed as soon as the F-35A dropped under $90 mil and it's CPFH dropped below the F-15E's. Just because you don't need stealth for ANG duties, if the cost of the LO platform is the same as or cheaper than the non-LO aircraft, then why not fill the ANG units with stealth? F-4 Phantoms could easily fill ANG duties for homeland defense. Should the US have kept the Phantom in production just for to catch the occasional Cessna that flies off course? Or to intercept Russians on the West Coast? Why do we have F-22s doing that? You don't need a stealthy supercruiser to catch a bomber. It may also be that the F-35 has such dramatic advantages air to air that training exclusively on the air to air mission isn't warranted. I mean, if they can't see you, but you can see them and possess the means to reach out and touch them... there's not a lot of dogfighting that'll be going on. On the other hand, I like the idea of a unit training JUST for air to air. I'm not certain why we couldn't devote some F-35 squadrons to that mission? They're going to be cheaper, check. They're going to be more capable, check. They're going to retain their air to ground capability if needed, check. Should just be a matter of switching out the pilot given an air to air or air to ground mission. Am I missing something, or is it not just that simple? botsing wrote: It's silly to train for that once in a lifetime situation while you can put that same training-time into preparing for actual real life combat. training for that once in a lifetime situation is what every Nuclear armed unit does all the time. thats difficult to imagine but I wouldn't say impossible. The United States has dispatched warplanes to patrol the skies over the Baltic region in an attempt to reinforce its allies from the North Atlantic Treaty Organization (NATO) against what Washington regards as an alleged “Russian threat,” as Moscow is gearing up for major military drills. Lithuania's Defense Ministry announced in a statement that seven US Air Force F-15 Eagle fighter jets had already landed in the country’s northern Siauliai military airbase, adding that the newly arrived fleet would begin to conduct the mission of air police over the Baltic States from September 1. No mention of F-22s or F-35As or Bs ready to swoop in if the Flanker-E/S shows up. Boeing intends to deliver the F-15X at a flyaway cost well below that of an F-35A....Boeing will offer the F-15X under a fixed priced contract. In other words, whatever the jets actually end up costing, the Pentagon will pay a fixed price—Boeing would have to eat any overages. In addition, our sources tell us that F-15X cost-per-flight-hour has been deeply investigated both by Boeing and by third parties by leveraging metrics from legacy F-15 operations and those of late-model Strike Eagle derivatives and even other fighters in the USAF's inventory. The final figure is said to be around $27,000 per flight hour. RCPFH (which is fuel & maintenance) has been coming down since day one. For FY2019 they seemed to have called a mulligan and just increased virtually everything across the board for inflation only instead of recalculating real-world costs. 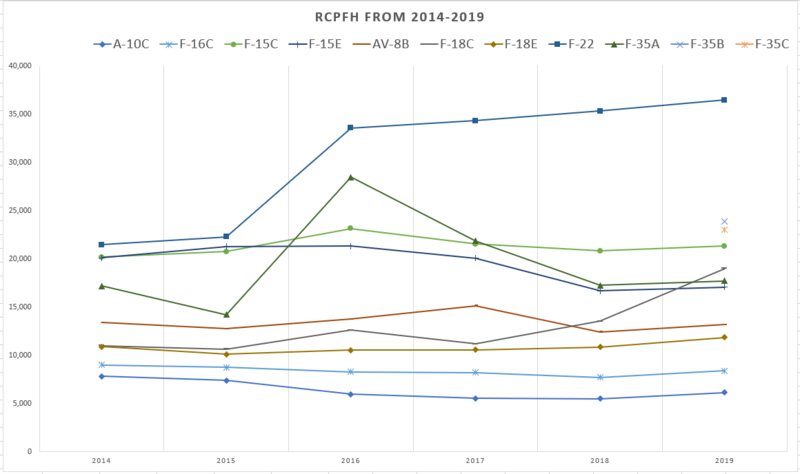 For FY2019 the RCPFH of an F-35A is just above the F-15E. If the price is indeed going to be lower, then it can mean only 1 of 2 things.. 1.) It's going to be devoid of any new motors, significant enhancements in radar/EW etc (Not much more capable than an F-15C) OR.. 2.) It's going to cost Boeing $, not make them $. It may well be that Boeing is shooting for #2, in an effort to keep the production line open to sell F-15SA like aircraft to other nations. It may also be their attempt to keep a foot in the fighter game, because if F-15 orders dry up - then their only project of note is the SH, and the sunset on that airframe is within view now too. I rather agree that if the price for an F-35 is similar or lower than any F-15, we're better off buying the F-35 - even for less demanding missions. It might not need stealth in that environment, but what about combat deployments? The F-15's here in MA are responsible for the air defense of the entire Northeast. Yet, I've seen them deployed in air superiority missions to hotspots around the globe. If that's going on, why wouldn't you want an F-35? It integrates better into an increasingly F-35 centric world, has worlds better performance and is going to be relevant for a hell of a lot longer. If they do the F-15X, I hope it's the penultimate Eagle. But with better options, not for the USAF. Give them to say South Korea if they're looking for something to beef up their air superiority fleet. There's nothing North Korea is going to counter them with that can compare, and if the Chinese get involved then US F-35's will be right there. Plus, let's not be like Canada..
"Flying, fighting and investing in today's aircraft, tomorrow... "
Well hold on, they already said their baseline for the F-15X is the F-15QA and SA. Is it possible for them to make the F-15QA at around $80M... Who knows. I wonder if it can compete with an AESA equipped Typhoon both BVR and WVR? zero-one wrote: Is it possible for them to make the F-15QA at around $80M... Who knows. F-15SK was $100M in 2006, why would the SA or QA be cheaper now? Only thing seen so far on the F-15X is a hodgepodge of different pods and a lot of cost cutting which to me would say 4 Gen Sensor Fusion and also nothing like EODAS which is massive. Last edited by basher54321 on 16 Jan 2019, 16:59, edited 2 times in total. The figures supposedly leaked to said bloggers that (they say) are going to appearing the budget request was for 12 x F-15X at $1.2Billion. Don't know what that entails but it looks about right doesn't it. Which was explained above that Boeing would eat the losses. They cannot make them at ~$80M, but they will sell them at ~$80M.